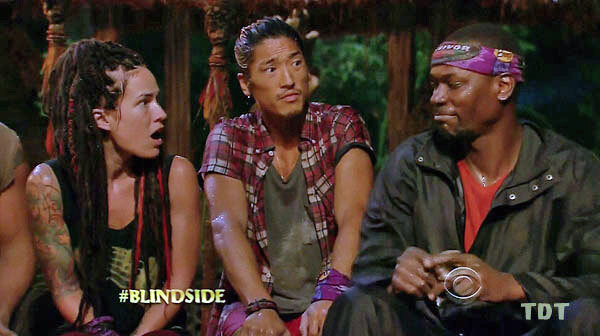 By now predictably unpredictable, Survivor: Cagayan continues to impress. With the starting tribes in the past and a merge on the horizon, there's a ton to cover this week. On Brawn Purple Solana, LJ's fate lies with a wolf and a cougar, as he entertains a marriage of convenience with Tony and marriage proposals from Trish. Did Tony make the right decision - if it even was a decision? Can he woo Sarah, or will he and LJ be watching the action from the jury bench? Meanwhile, the Brains are somehow the most cohesive group in the game and are being courted by some beautiful suitors. Who can they trust, and why is it not Alexis? And, in a season with two idols, many bold players, and the looming shadow of Tyler Perry, how many of our predictions will be comically disproven in the next few weeks? All this, and more, on this week's show, available below, here, or on iTunes here. After an impromptu hiatus (my bad), we're back this week to break down the last two episodes of Survivor: Cagayan. Did the Beauty tribe make the right call booting Brice over Morgan, and should they have thrown the next challenge to boot whichever of the two remained? When, if ever, will Tony's spool web of lies catch up to him? And did Kass and Tasha make the right call in letting Spencer make it to a swap? (Spoiler alert: LOLOL no). Plus, for the first time ever, we recorded the show just after Wednesday's episode finished airing, so tune in for all of the heat-of-the-moment hyperbole you could ever dream of on the player below, find the direct link here, or find us on iTunes here.